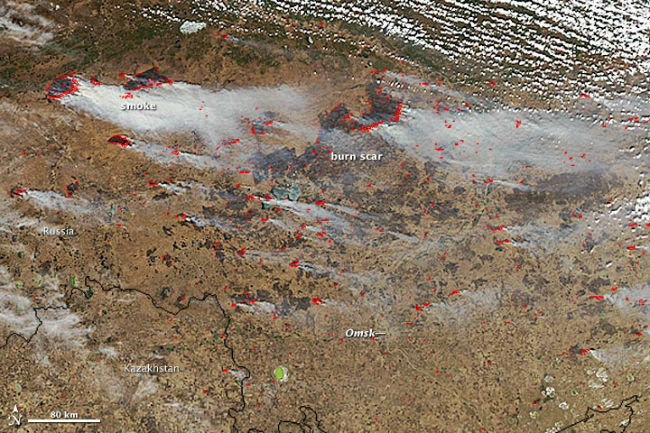 Back in April, thousands of hectares were burning when NASA captured above image of fires in a rural area north of Omsk, a city in south central Russia near the Kazakhstan border, according to the NASA report accompanying the image. 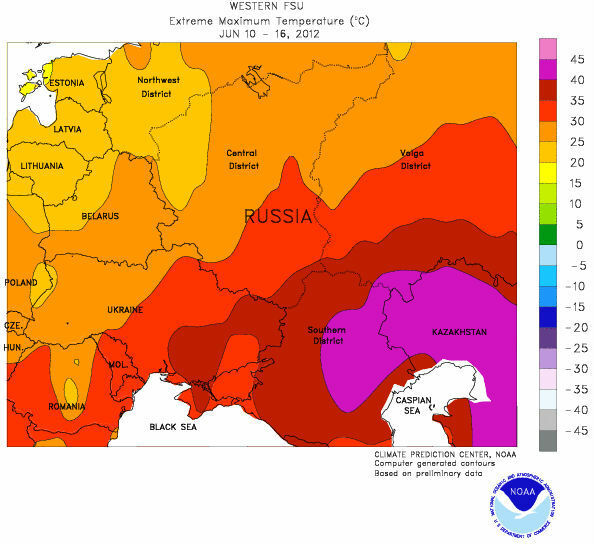 In May 6, 2012, the Voice of Russia reported some 11000 hectares (about 42.4 square miles) of forests in Siberia to be on fire. Earlier this month, eight Russian paratroopers died fighting a massive forest fire in southern Siberia, reports UPI. Russia has now declared a state of emergency in several eastern regions, due to hundreds of wildfires, reports NASA. Smoke from fires burning in Siberia can travel across the Pacific Ocean and into North America. 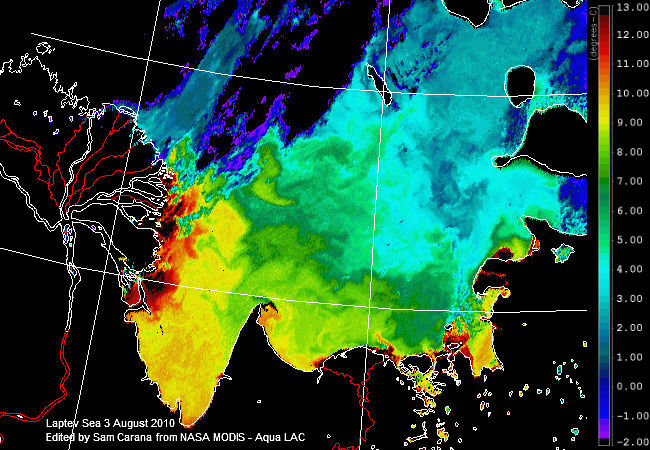 A NASA analysis of satellite images shows that aerosols from fires took six days to reach America's shores. In certain cases they saw smoke that actually circles the globe, describes NASA. 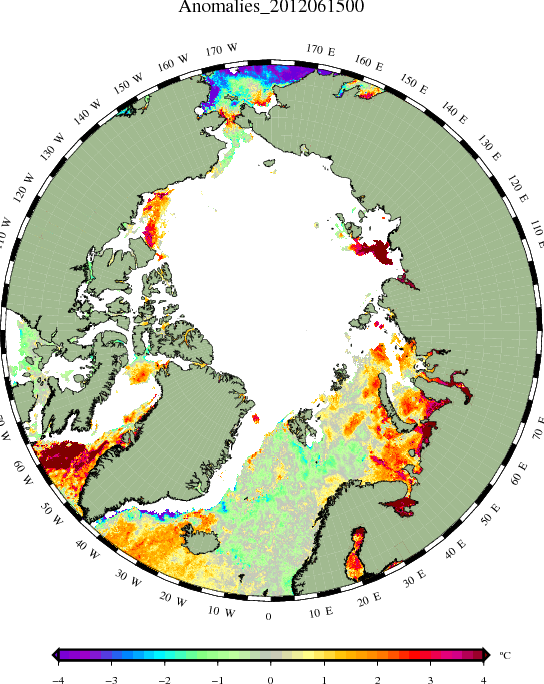 These fires are causing a lot of emissions, including soot that can be deposited on the ice in the Arctic, resulting in more sunlight to be absorbed which will speed up the melt. 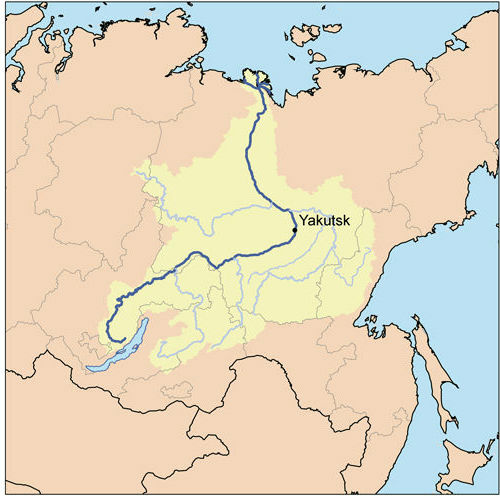 Furthermore, high temperatures in Siberia will warm up the water in rivers, causing warm water to flow into the Arctic, as illustrated by above Wikipedia image highlighting the Lena River and the August 3, 2010, satellite image below, showing warm river water heat up the Laptev Sea (degrees Celsius). 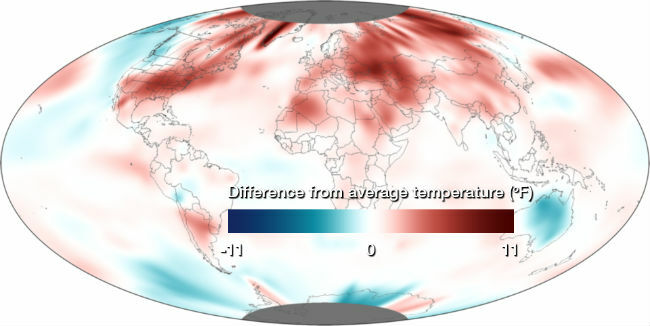 The image below was edited from a report by NOAA’s National Climatic Data Center, describing that the globally-averaged temperature for May 2012 marked the second warmest May since record keeping began in 1880. 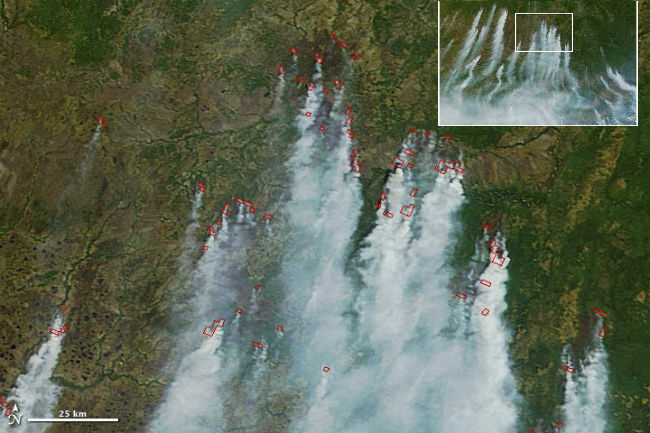 The image below was edited from a recent NASA report describing a total of 198 fires burning across Russia. As the inset shows, the fires on the main image are part of an area where further fires are raging. 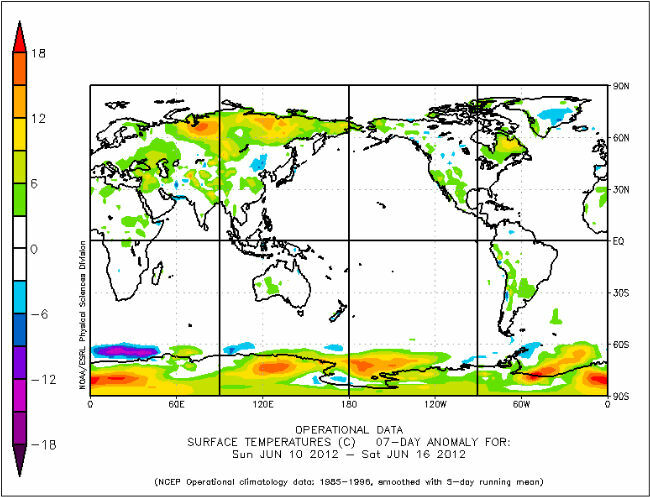 Below are two maps from the NOAA Climate Prediction Center, showing temperature anomalies in Southern Russia for the week from June 10th to 16th, 2012, of over 7 degrees Celsius (12.6 degrees Fahrenheit), with temperatures in areas around the Caspian Sea reaching over 40 degrees Celsius (104 degrees Fahrenheit). 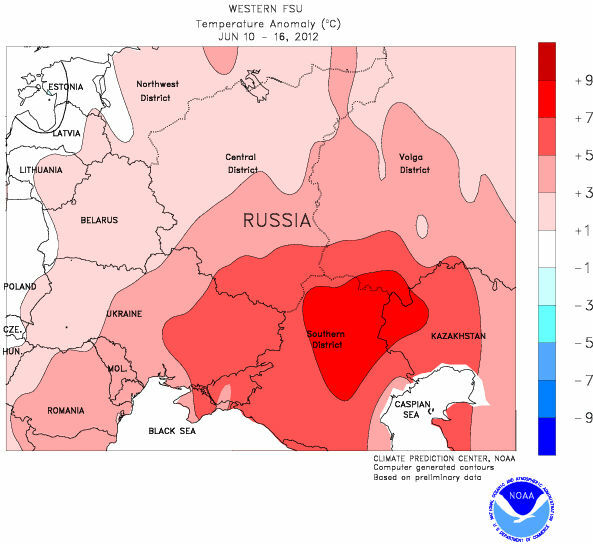 Perhaps even more worrying than high temperatures in Southern Russia are high temperature anomalies in Northern Siberia, some of which were in the 16-18 degrees Celsius range for the week from June 10-16th, 2012 (see NOAA image below). 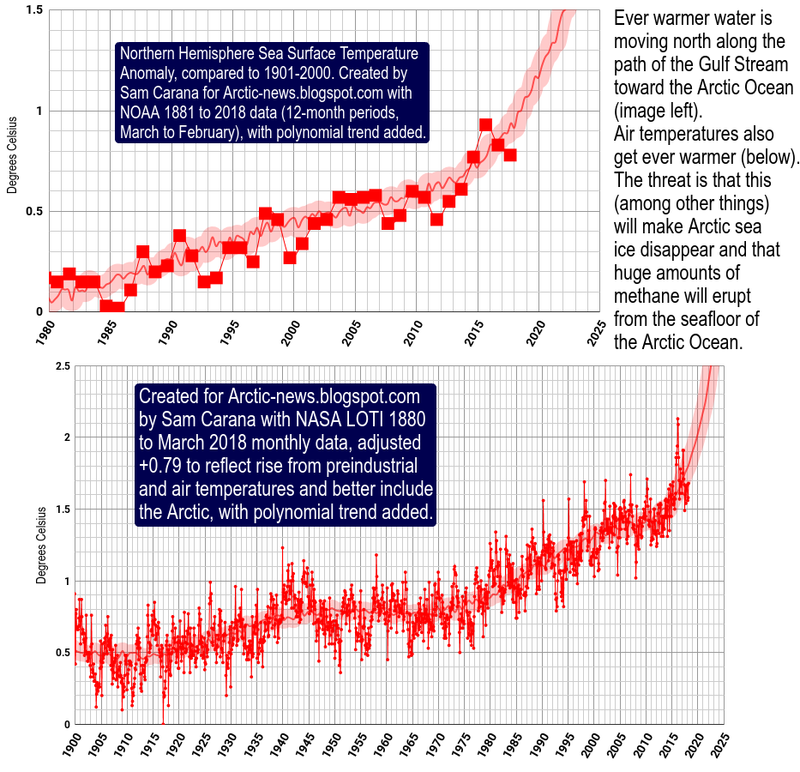 Hello, I am Ecosutra, I have tracked Fracking the water cycle, the hydrological cycle has been disconnected from under in Colorado and Texas. 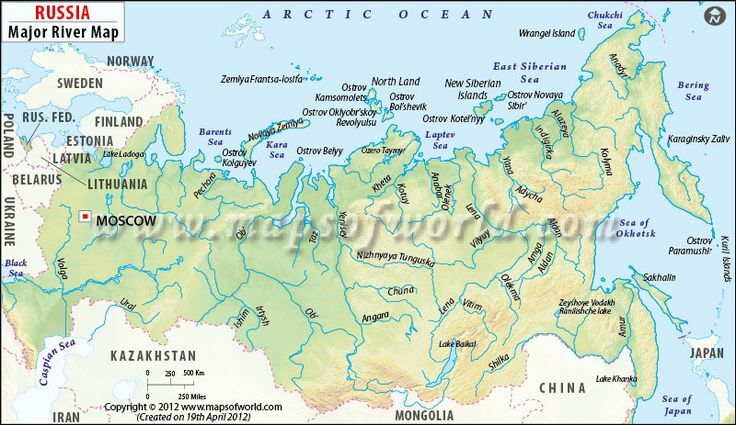 I dont speak Russian so its hard to find the Fracking wells on the map. Very easy on Google Earth when you connect the Frack attack dots with the Wildfires in Colorado. 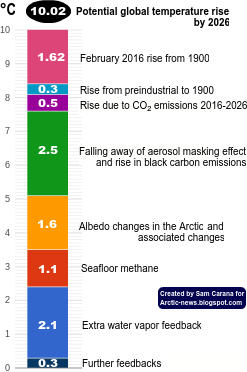 Exponential function consequence tipping point over shoot. I am amazed at the illiteracy civilization has about their watershed systems. Its over for this civilization. Plant trees on Permaculture swale to restore landscape. We set up a disaster and now we are seeing the effects from a decade of fracking water from life and disconnecting it deep down into the earth never to be seen again.